Assisted GPS (abbreviated generally as A-GPS) is a system that can in many cases greatly improve the startup performance or time-to-first-fix (TTFF) of a GPS satellite-based positioning system. It is used extensively with GPS-capable mobile phones, as its development was accelerated by the U.S. FCC's 911 requirement to make the location of a cell phone available to emergency call dispatchers. The assistance server has a good satellite signal, and plentiful computation power, so it can compare fragmentary signals relayed to it. Accurate, surveyed coordinates for the cell site towers allow better knowledge of local ionospheric conditions and other conditions affecting the GPS signal than the GPS receiver alone, enabling more precise calculation of position. I had used my Android in New Zealand and then returned home to Brisbane (2,500km NW of where I had been in New Zealand). I had not allowed data roaming in NZ. 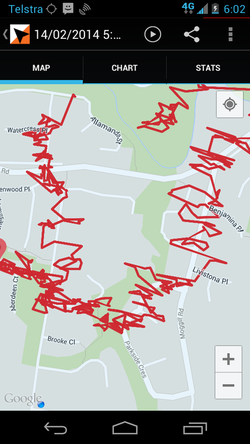 Upon my return, on a clear day, with good GPS reception, the track I recorded is shown in the above screen print!! 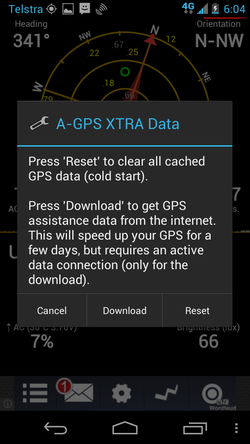 To remedy this, I used an app to re-download GPS assistance data and this corrected the issue immediately. I used the "GPS Status & Toolbar" app from MobiWIA installed. This includes functions to manage the Assisted GPS functions. I found that if if I resetthe A-GPS nothing changed. But if I used "Download" the issue was fixed immediately.